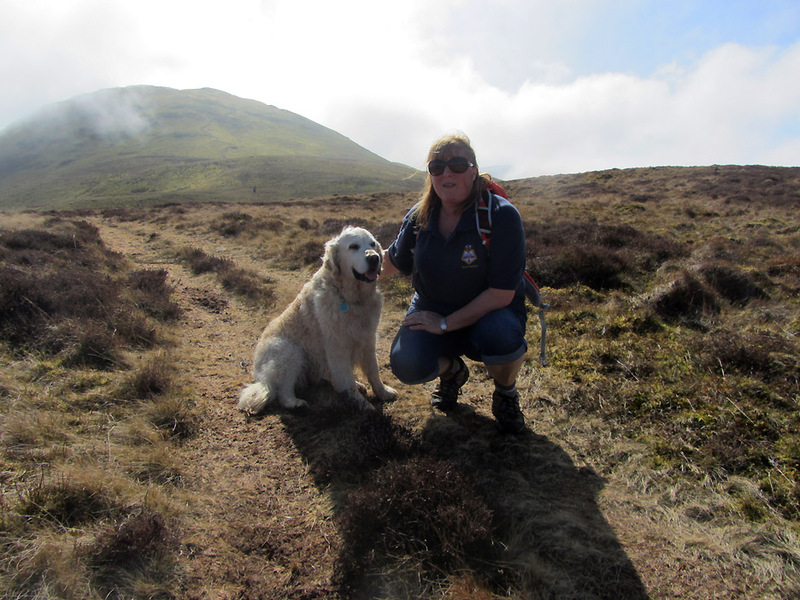 " Hen Comb with Cathy "
Date & start time: Easter Sunday 5th April 2015, 12.30 pm start. 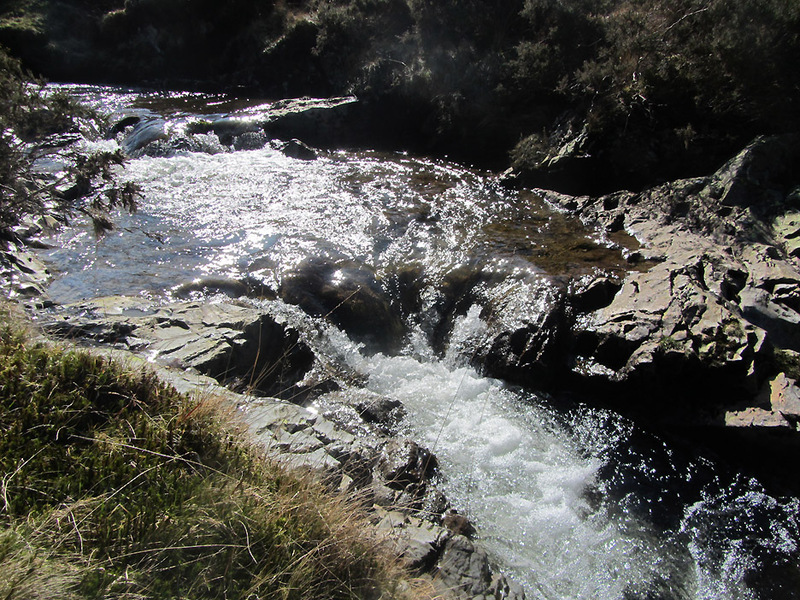 Places visited : Kirkhead, Harry's Pool, Hen Comb and back. 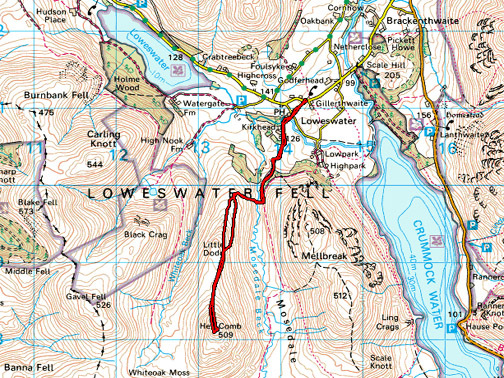 Walk details : 4.8 mls, 1350 feet of ascent, liesurely 3 hours 40 mins. 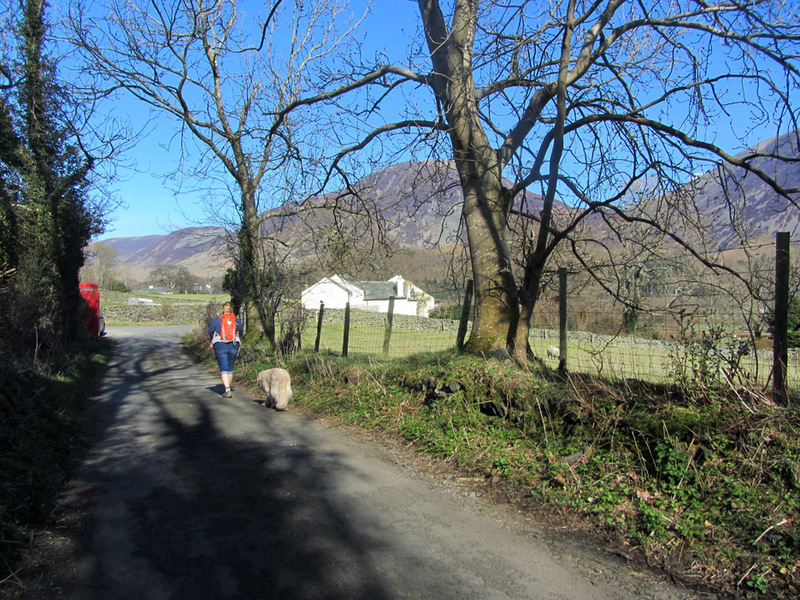 Walked with : Ann, daughter Cathy and one dog, Harry. Weather : Sunshine and blue skies, valley mist. Cathy decided she would like a less arduous walk as she was driving back to Surrey that evening. 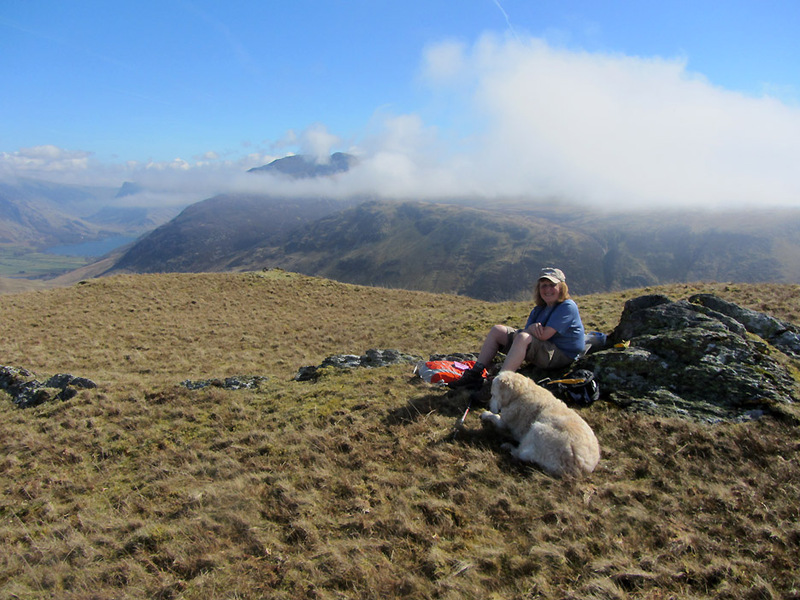 She and I took Harry for a gentler walk up to the summit of Hen Comb. It was a great day and the cloud effects just added to the pleasure. 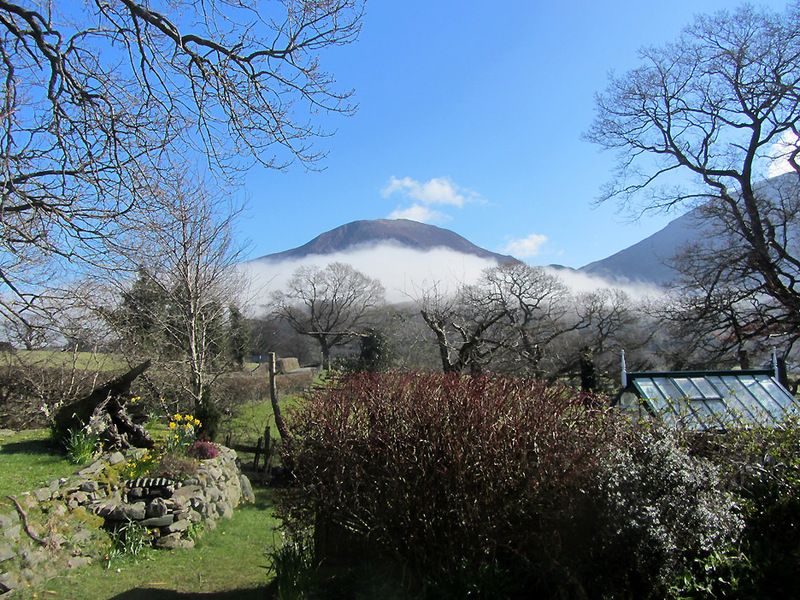 A mystical day with clouds swirling around the fells surrounding our garden. 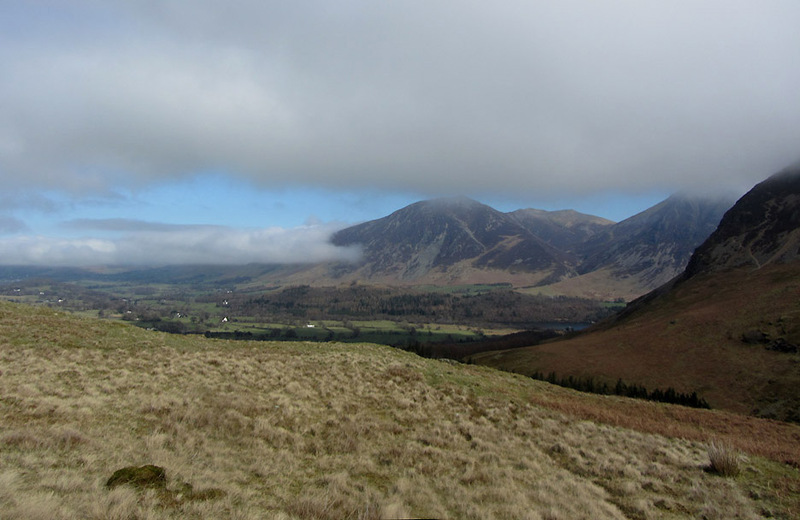 We had dropped the boys off by car at Whinlatter, into that cloud to the left of Whiteside. 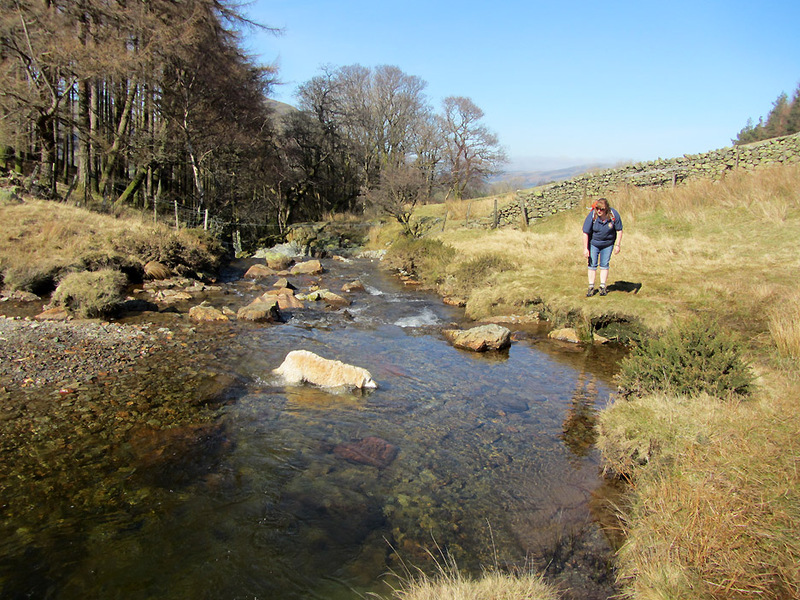 as we make our way towards Hen Comb. 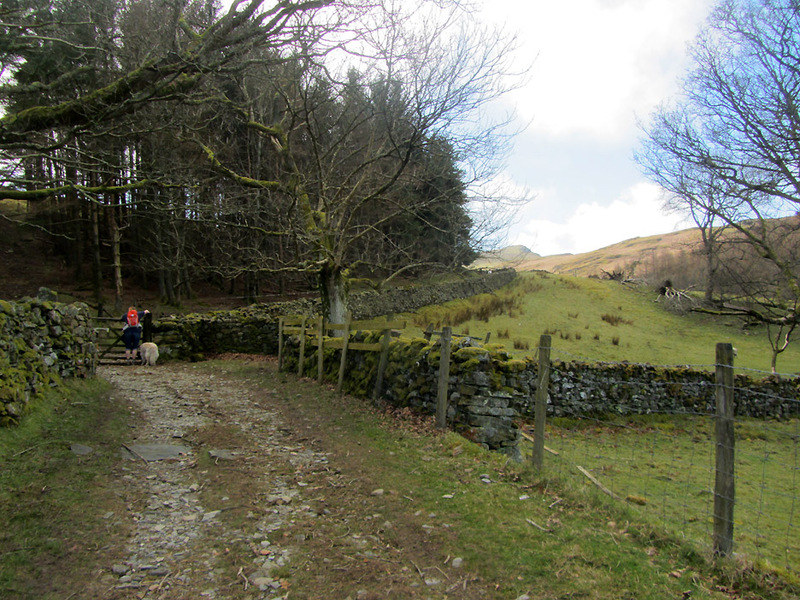 Cathy and Harry reach the gate at the end of the lane. The summit of Hen Comb can be see in the far distance. Harry had a swim in 'his' pool . . . with the promise of a another dip for him on the way back. A thicker layer of higher mist is coming in from the coast as we start to gain height. 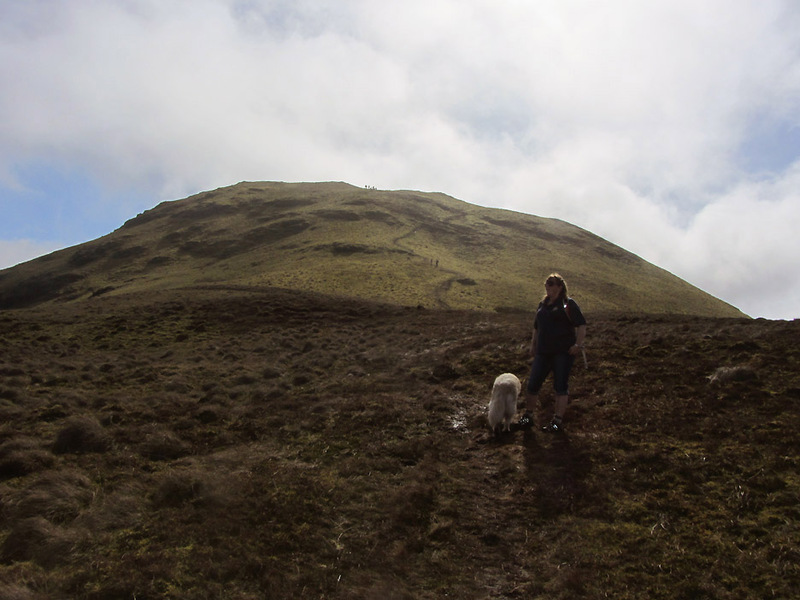 Darling Fell and Low Fell both have their heads in the cloud. The Solway coast can be seen to be enveloped in thick fog . . . friends visiting there today said that it was cold and misty all afternoon. 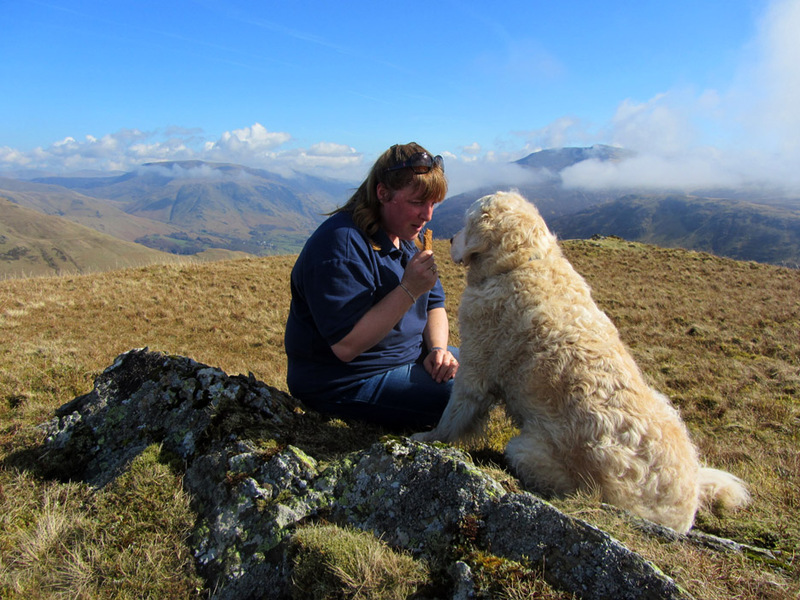 Just a wisp of cloud on Hen Comb as Cathy and Harry stop to admire the ever changing clouds surrounding the fells. The final steep pull up to Hen Comb summit is just ahead. 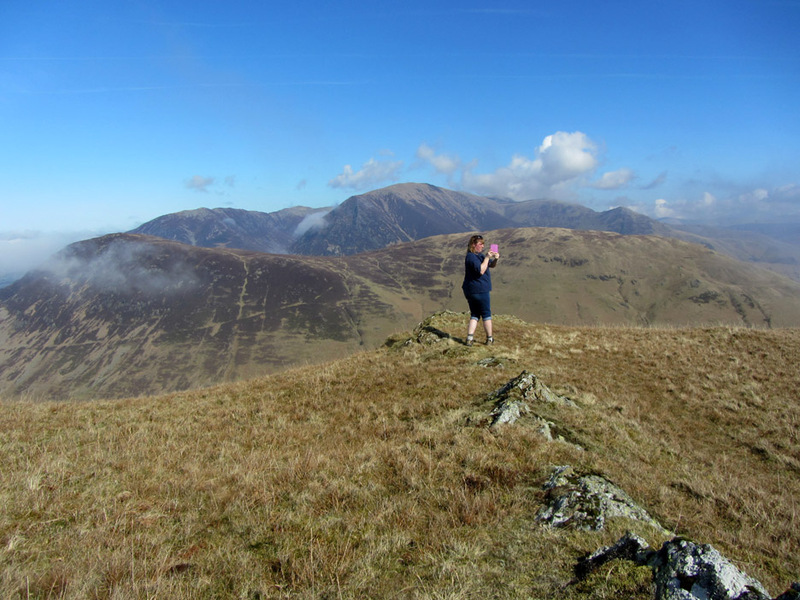 This a relatively unfrequented fell, but we met about half a dozen folk out enjoying the beautiful weather today. 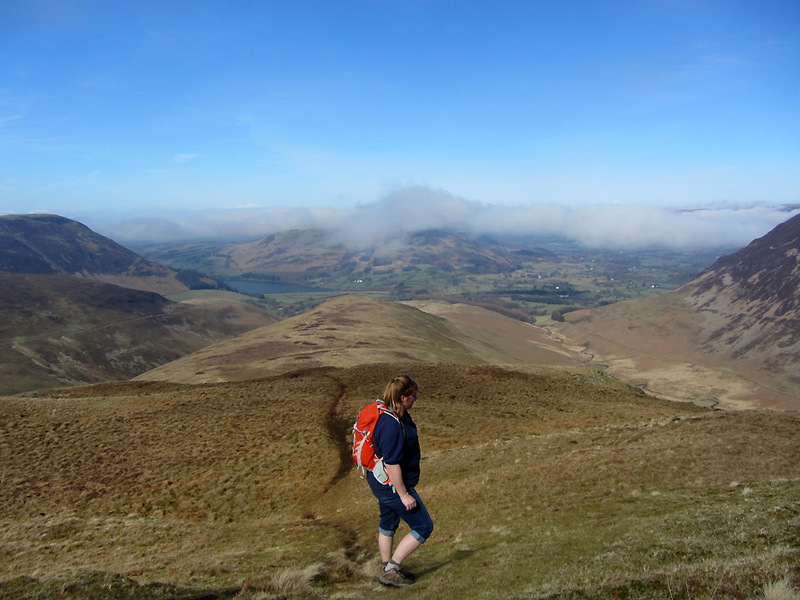 Lorton valley is now covered in mist as we look back over our outward route. 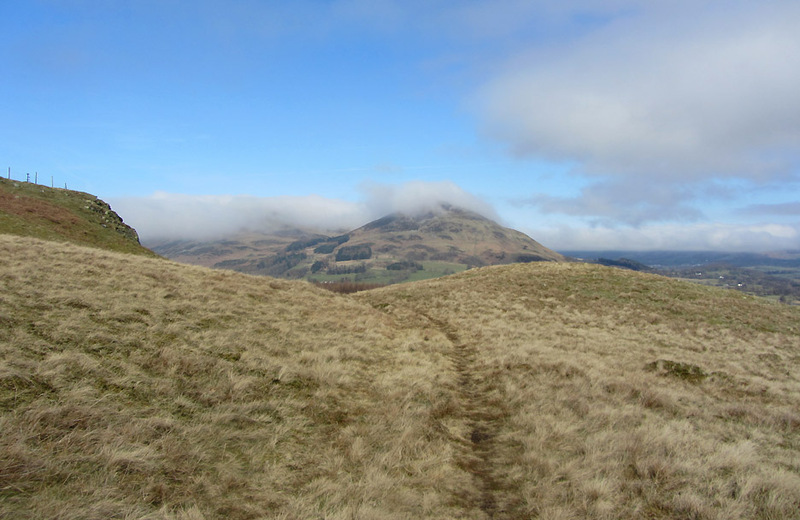 The summit attained, and the ever changing cloud patterns have revealed the majority of the NW fells are now clear. 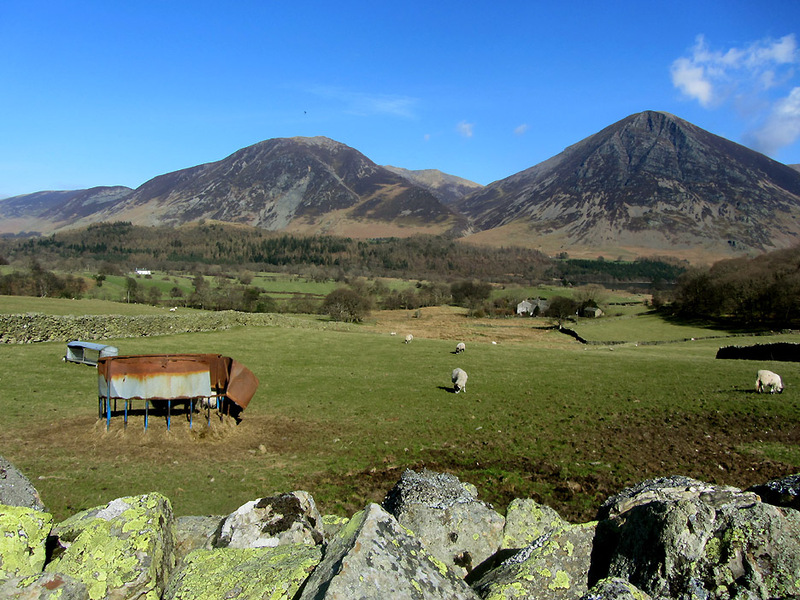 Mellbreak is the heather covered fell just beyond Cathy, with Whiteside and Grasmoor in full view behind. 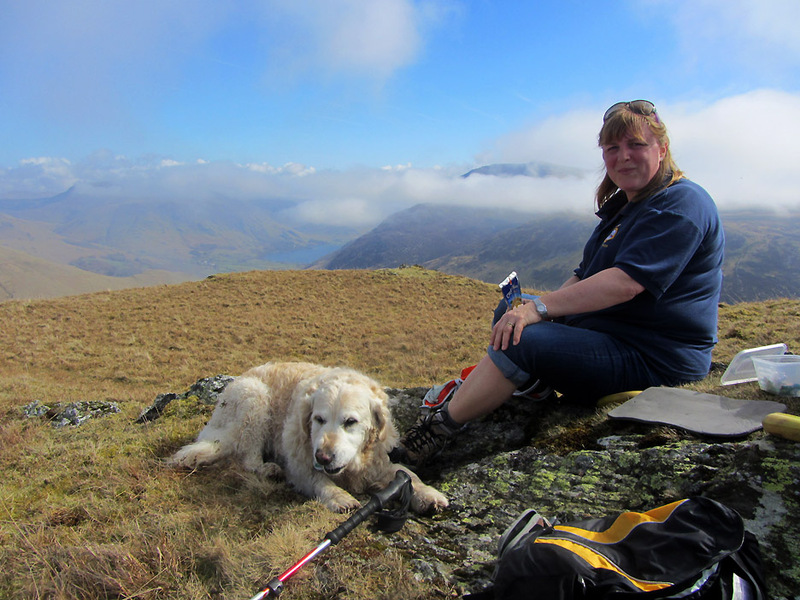 We could have waved to the boys as they should be on the summit about now. Cathy concentrating on her panorama. A small amount of cloud drifts past Melbreak but behind us the coast still covered in dense fog. 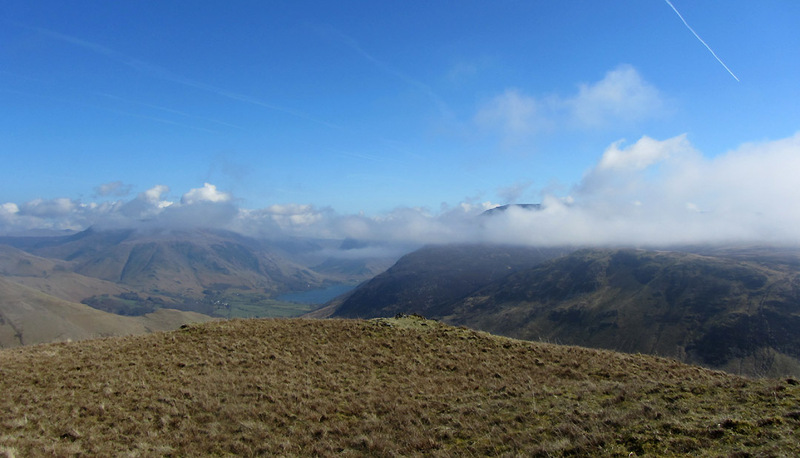 The view to Buttermere from the summit. That is Ling Comb Edge and Red Pike just peeping out above the cloud on the right. Cathy's turn to take my camera, please note the early season shorts and t-shirt ! I was in winter gear at the beginning of the week ! We had forgotten Harry's lunch . . . but he was more than happy eating the majority of our flapjacks. 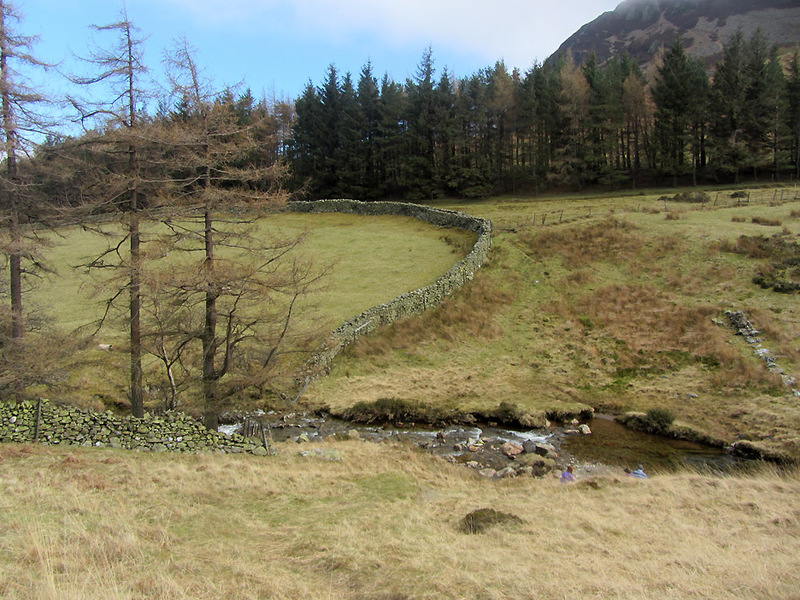 along with most of the fells surrounding Buttermere village. Lorton valley is clearing as we reverse our route to head down the ridge. Still stubborn fog envelops the coast and continues to cling to the western side of Low Fell. Someone has remembered that promise of another swim . . . and has rushed down ahead of us ! Harry is standing in the water waiting for us to arrive and throw him some sticks. 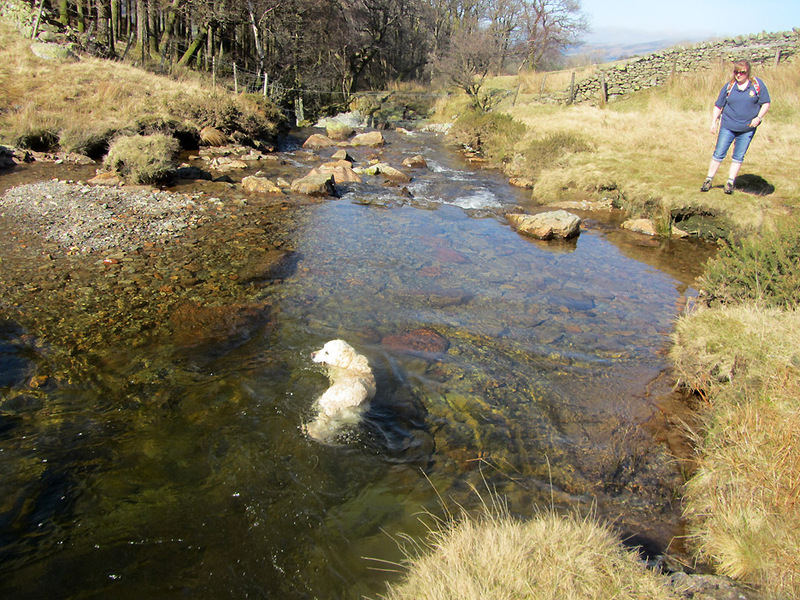 Sunshine, rocks and gushing water . . .
. . . and a happy Harry ! He is in no rush to come out. The weather may be warm, but the water is not ! On our way home now and we can see the boys will be enjoying this weather as much as we are. 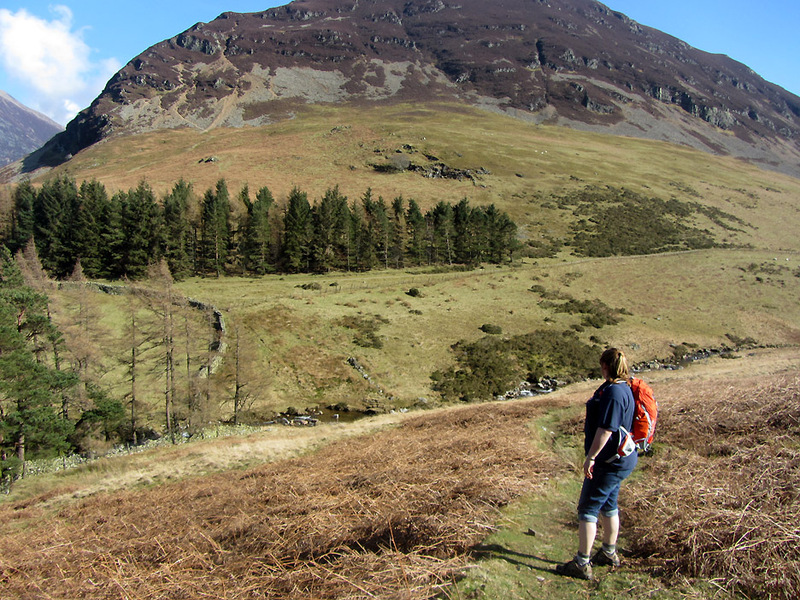 walking down Lad Hows to Crummock and taking the field route back to the cottage. We arrived back to the cottage about twenty minutes before the four boys and the two younger dogs, Dylan and Boris. Tea and cake in the garden was the order of the day for us all. This site best viewed with . . . sunshine and ever changing views.